The life of an influencer seems like one of endless glamour and fun. Being courted by big brands, free goodies, tickets to events, it seems like the perfect life! While all this might be true, influencers have often attained position through a lot of learning and hard work. Building up a huge online following is no easy feat, and producing consistently high quality, informative and interesting content is a full-time job. Their fans often number in the thousands and hundreds of thousands – the most successful influencers boasting over a million – and the care and attention they have put into earning their large followings gives them huge clout when it comes to promoting brands and businesses. When it comes to fashion, it’s no longer the glossy magazines and haute couture houses that are calling the shots. The men included in this list all have a passion for menswear, and their style choices and recommendations are eagerly snapped up by their droves of followers on a daily basis. So if you’ve ever fancied yourself as a budding social media influencer, or you love keeping up to date with the latest trends, make sure to check the lads out on Instagram for the latest style tips, curated fashion content and, of course, stunning photographs. And if all of this has got you hankering for some retail therapy, you’ll find everything you could possibly need in our menswear section. New York-based blogger Adam Gallagher boasts a huge fanbase of 2 million followers on Instagram. He’s a frequent traveller, to the degree that his blog has a map displaying where in the world he currently is, and he often combines his passions for men’s fashion and travelling in his content. He most recently collaborated with huge brands Gilette and Hugo Boss, and last month his blog delivered comprehensive coverage of London Fashion Week. 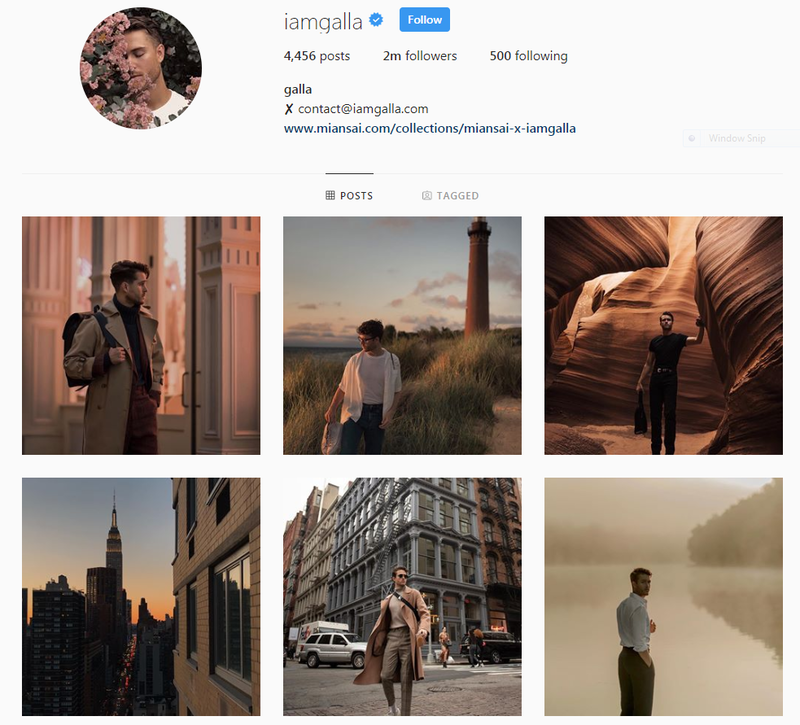 His Instagram is perfectly curated with a beautifully muted colour scheme, currently featuring tones of orange, red and brown. Even his Instagram feed has style chops! So if you’re a wanderluster with a passion for high fashion, make sure to check Adam out! You’d expect an ex-model to have an impeccable fashion sense, and this titan of a menswear influencer does not disappoint. Mariano Divaio hails from Italy and his modelling career boasts a portfolio including Gucci and Cavalli. 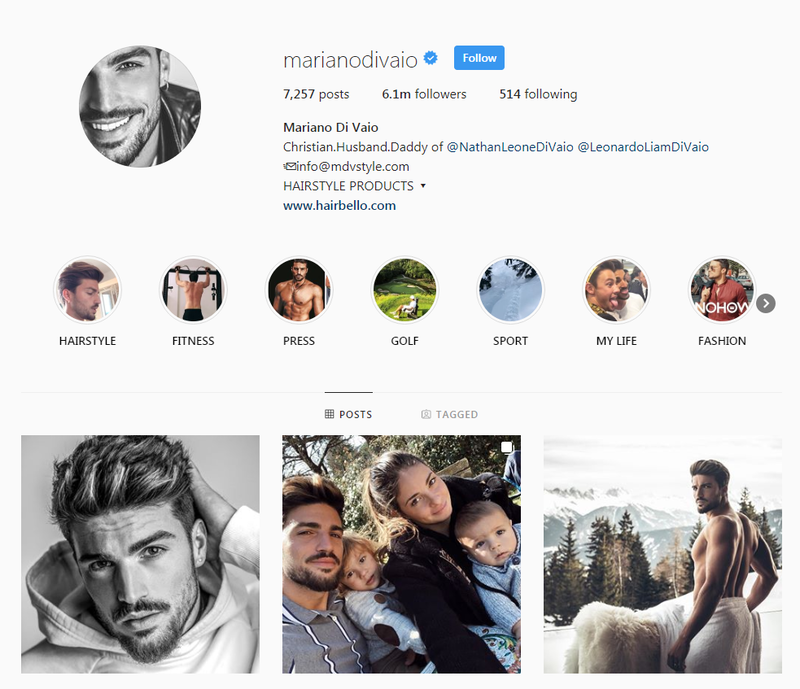 Family man Mariano is known for featuring images of his wife and children on his feed, alongside high fashion portraits and beautiful vistas. His effortless Italian style is demonstrated through his suave fashion choices. Mariano is a huge fan of a dapper, well-fitted suit, examples of which can be seen throughout his feed, as well as plenty of sun-drenched beach photos in which he models endless pairs of stylish shorts. Mariano is a man that has it all, so if you’re a family man that loves high fashion or you just like male models, make sure you head over to his page! Not your average fashion influencer, Phil Cohen has never posted a selfie. 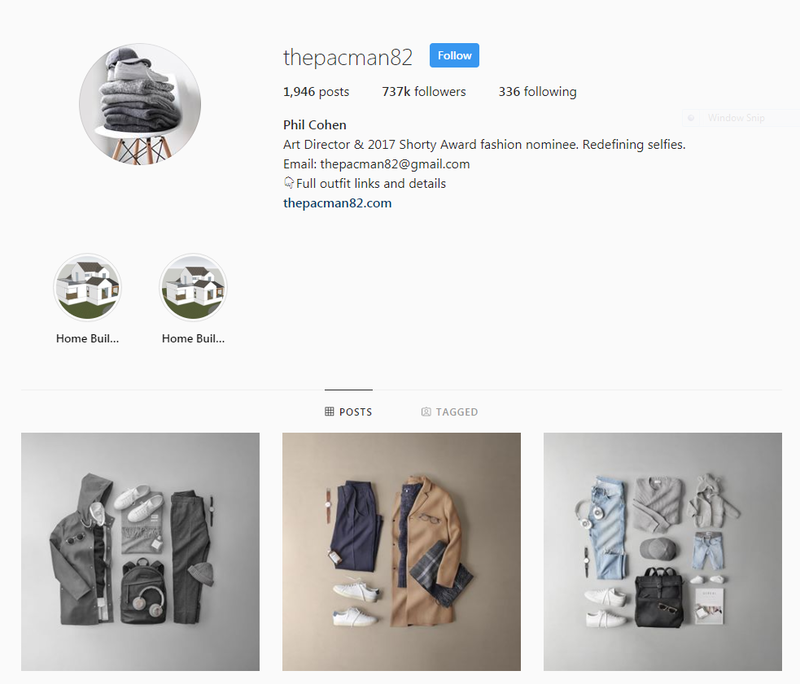 Instead, his feed is populated with impeccably positioned flat lays with all the items coming together to make up a full outfit. This is fashion influencing for the un-fussy. He has over 700,000 followers and the outfits he chooses range from menswear to childrenswear so there is something for everyone. His photographs are pristine in their presentation, hardly surprising given Phil is an Art Director, as well as having been nominated for a fashion Shorty Award. For straight-up fashion without the fuss, make sure to check out Phil’s Instagram page. Ryan Clark is a New York-based men’s fashion blogger who founded the insanely popular blog High Fashion Living. A huge fan of high-end tailoring, Clark populates his Instagram with images of himself posing effortlessly in high fashion outfits, images of his travels and of course videos and pictures of all the fashion shows he is invited to. His blog covers womenswear as well as men and features an impressive array of huge brands, such as Adidas, Givenchy and Jaeger Lecoultre. 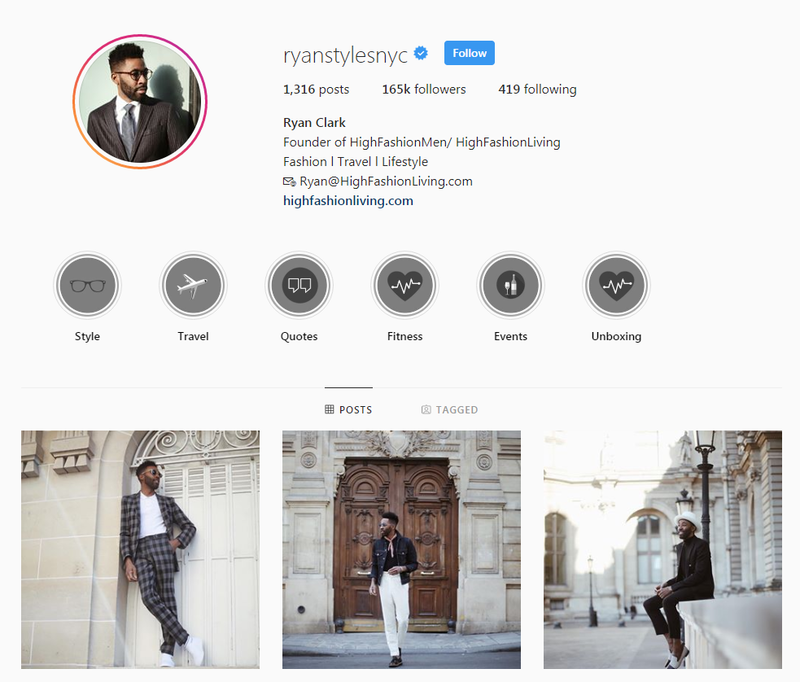 If you’re looking for the perfect influencer to teach you a thing or to about effortless cool, make sure to give Ryan a follow. Originally from Portsmouth, Sam studied Musical Theatre at the prestigious Guildford School of Acting before becoming a men’s fashion influencer full time. Now based in London, Sam has recently worked with Toni&Guy at London Fashion Week, as well as Aspinal of London. 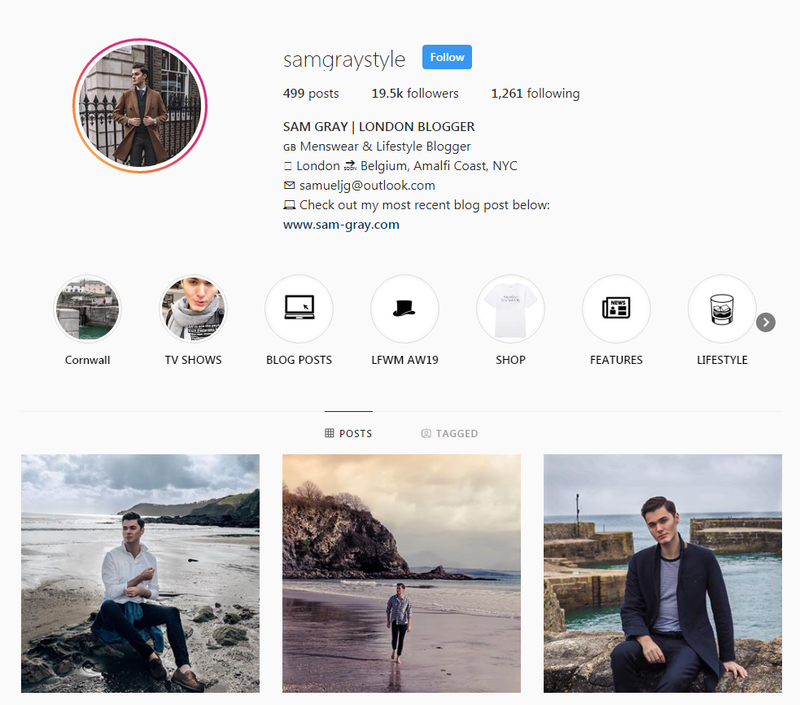 He runs a blog, Sam Gray Style, which he frequently updates with style advice and brand collaborations. Sam is an up and coming blogger with nearly 20,000 followers with this number growing quickly as he continues to align himself with high-end British brands and dole out up to the minute fashion advice on the latest trends and brands to watch. Keep an eye out for Sam!